What do you do with your trash? Does it goes go to the landfill? Trash and garbage are words for solid waste. Solid waste often ends up in landfills. We can help lower the amount of solid waste going into landfills. 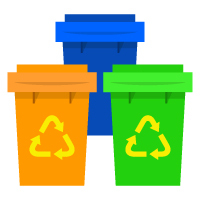 Reduce, reuse, recycle are the 3 Rs of waste management. By following the 3 Rs we use less and help the environment. Try the questions. Then, watch the video.